Emotion is at the centre of our personal and social lives. To love or to hate, to be frightened or grateful is not just a matter of how we feel on the inside: our emotional responses direct our thoughts and actions, unleash our imaginations, and structure our relationships with others. Yet the role of emotion in human life has long been disputed. Is emotion reason?s friend or its foe? From where do the emotions really arise? Why do we need them at all? 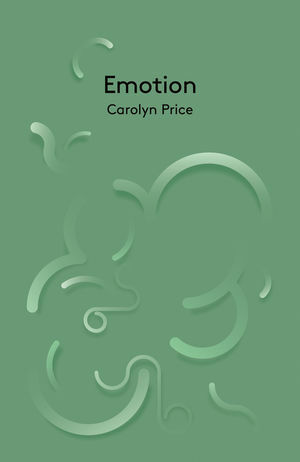 In this accessible and carefully argued introduction, Carolyn Price focuses on some central questions about the nature and function of emotion. She explores the ways in which emotion contrasts with belief and considers how our emotional responses relate to our values, our likes and our needs. And she investigates some of the different ways in which emotional responses can be judged as fitting or misplaced, rational or irrational, authentic or inauthentic, sentimental or profound. Throughout, she develops a particular view of emotion as a complex and diverse phenomenon, which reflects both our common evolutionary past and our different cultural and personal histories. Engagingly written with lots of examples to illuminate our understanding, this book provides the ideal introduction to the topic for students and scholars and anyone interested in delving further into the intricate web of human emotion. Carolyn Price is a lecturer at the Open University. She joined the department in February 2000, having spent eight years as a Lecturer and Tutor at St Hugh's College, Oxford. Her research interests lie in the Philosophy of Mind: she is particularly interested in questions about meaning, rationality and emotion, and the connections between them. Chapter 4 What is an emotion? Chapter 5 What is an emotional evaluation? Chapter 6 What are emotional evaluations about? "In this short book Carolyn Price elegantly condenses a sophisticated understanding of the philosophy of emotion into eight very readable chapters. While offering a novel explanation and defence of a functionalist, teleosemantic position, the book also situates this position clearly and fairly in wider philosophical debates about emotion. As such, Price's measured assessments of alternative positions also offer an excellent introduction to readers who are new to this important and emerging topic. The book will be stimulating reading for students and researchers alike." "This is a splendid book: clearly written, empirically informed, philosophically astute, and a pleasure to read. It contains a wealth of good arguments, and makes interesting and original points on all of the central issues in the philosophy of emotion. Highly recommended."